Changing computers, me for at least, ranks very highly in the list of life’s most dreadful experiences ! I’m in the middle of that now, unable to access half my pc right now, so I’ve got to remember off the top of my head all the things I was going to write about …. I missed the first day of filming today at Apley Farm Shop, but will be there tomorrow to help out. Amelia & Agata devised a great schedule & met Phil down in the Walled Gardens this morning at 6h15 to catch the sunrise. It was one of those rare, glorious, first days of Spring – warm, dry, sunny – they were very lucky as tomorrow looks rather damp. These films will be used in-house & on all our social media platforms, better portraying all that we’re doing & to a wider audience. In the meantime, I’ve caught up with Anna Henly who’s an amazing friend photographer who’s agreed to be our virtual photography competition judge. Adult prizes will be Farm Shop vouchers & I’ve a lovely selection of prizes in case Anna chooses some of the children’s entries (she will be judging without seeing entrants’ details). 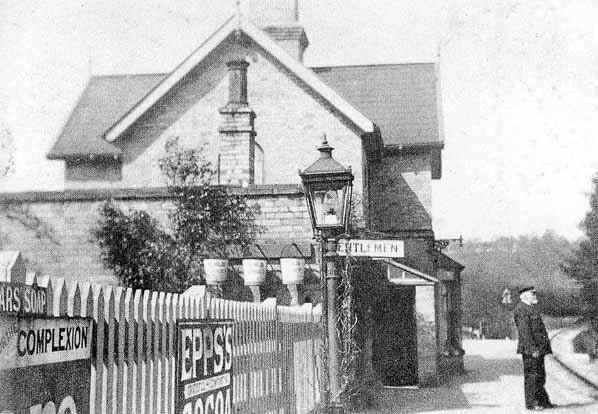 I refound this great Linley Station photo taken in about 1905 which I thought I’d lost. Adrian, our Farm Manager, calving is going well & they’ve had a set of twins already. Apley Walled Garden private tours start in March. Amongst others, we are looking forward to welcoming a bus load of 29 & a group of 10 friends. The Apley Walled Garden beginners’ gardening courses start on Wed 25 March & the Spring session of the Three Season Course will be on 15 April (you don’t have to attend all 3).